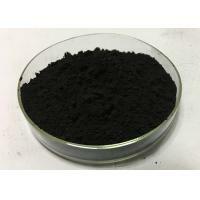 Character black to brown black amorphous or crystalline powder.Goods still have granular, linear and so on.Slightly hygroscopic.Soluble in dilute acid, cyanide or ammonium carbonate solution, slowly dissolve in ammonia, almost insoluble in water and ethanol.Relative density (d144)6.315.Melting point is 1026 ℃.It's stimulating. Determination of carbon in use gas analysis.Organic reaction catalyst.Make rayon and other copper compounds.Optical glass luminant.Used as color material for artificial gem, colored glass, ceramic glaze color. Health hazard: accidental ingestion or inhalation of large amounts of copper oxide dust may cause metal smoke fever, cold war, high body temperature, accompanied by respiratory irritation.Prolonged exposure may cause respiratory and ocular conjunctival irritation, epistaxis, nasal mucosal bleeding points or ulcers, even septum perforation and dermatitis (the above pathological reactions are not confirmed). Skin contact: remove contaminated clothing and rinse with flowing water. Eye contact: lift eyelid and rinse with flowing water or saline.Go to a doctor. Inhalation: remove from site to fresh air.If breathing is difficult, give oxygen.Go to a doctor. Food intake: drink plenty of warm water and vomit.Go to a doctor. Dangerous characteristics: no special combustion explosion characteristics. Harmful combustion products: do not burn, must with reducing agent to burn. Fire extinguishing method: fire fighting personnel must wear full - body fire - proof clothing, in the wind to put out the fire.Remove the container from the fire to the open area as much as possible. Emergency treatment: isolate the contaminated area and limit access.It is recommended that emergency treatment personnel wear dust mask (full cover) and wear protective clothing.Avoid dust, carefully sweep, and transfer to safety in the bag.If a lot of leakage, use plastic cloth, canvas cover.Collection or transport to waste disposal sites. Operation precautions: closed operation, local exhaust.Operators must be specially trained to strictly observe operating procedures.It is recommended that operators wear self-absorption filter respirators, wear chemical safety goggles, wear protective clothing and wear rubber gloves.Avoid dust.Avoid contact with reductant, alkali metal.Light loading and unloading in case of damage.Equipped with leakage emergency treatment equipment.Empty containers may have a residue. Storage precautions: stored in a cool, ventilated warehouse.Keep away from fire and heat.Should be separated from reducing agent, alkali metal, edible chemicals, avoid mixing storage.The storage area shall be equipped with suitable materials for receiving the leakage. Transportation precautions: the packing should be complete when starting and loading should be safe.During transportation, make sure that the container does not leak, does not collapse, does not fall, does not damage.It is strictly forbidden to mix with reductant, alkali metal and edible chemical.Should be protected from exposure, rain and heat during transportation.The transport of vehicles should be thoroughly cleaned. Artificial silk, ceramics, glaze and enamel, batteries, petroleum desulfurizer, insecticide, also for hydrogen production, catalyst, green glass, etc.